AC Cars was established in 1907 and is the oldest British car manufacturer that is still producing vehicles today. The AC name came from the name of their first commercial three wheeler – the autocarrier, which was designed and manufactured by John Weller. In 1908, a new passenger version called the “AC Sociable” was introduced. The name came about because the passenger and driver’s seat were side by side and not in tandem as many other three wheelers were at the time. It was also the first time that the initials AC had been used. During World War 1, AC continued to produce vehicles as well as shells and fuses. By 1919, they were back in full car production with 10hp and 12hp engines. These were later replaced by a six cylinder 16hp model. For the next few years, AC turned to producing four wheeled vehicles and did not produce another three wheeler until 1953 with the AC Petite. The petite was powered by a 346cc single cylinder two stroke Villiers engine and had an aluminium body fastened to a light steel frame. The all new Ace arrived in 1953, designed by John Tojerio. The Ace used the old 1991cc AC engine. 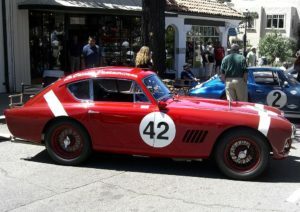 The distinctive body was produced in aluminium and looked similar to contemporary Ferrari models and it would also form the basis for the lengedary Cobra. The AC Cobra was produced during the 1960s and is perhaps one of the most iconic cars of all time. The first 75 ‘Cobra Mark I’ (including the prototype) were fitted with the 260 engine (4.2L). The remaining 51 ‘Mark I’ models were fitted with a larger version of the Windsor Ford engine, the 289 in³ (4.7L) V8. By 1963 the leaf-spring Cobra was losing its supremacy in racing. Shelby tried fitting a larger Ford FE engine of 390 in³. Ken Miles drove and raced the FE-powered ‘Mark II’ and pronounced the car was virtually undrivable, naming it ‘The Turd’. A new chassis was developed and designated ‘Mark III’. Cobra Mark III production began on 1 January 1965; two prototypes had been sent to the United States in October 1964. Cars were sent to the US as unpainted rolling chassis, and they were finished in Shelby’s workshop. Unfortunately, the Mark III missed homologation for the 1965 racing season and was not raced by the Shelby team. However, it was raced successfully by many privateers and went on to win races all the way into the 1970s. Interestingly, 31 unsold competition cars were detuned and made road worthy and called S/C for semi competition. Today, these are the rarest and the most valuable models. AC Cobras had an extensive racing career. Shelby wanted it to be a “Corvette Beater” and at nearly 500 lb less than the Chevrolet Corvette, the lightweight car did just that. The Cobra was perhaps too successful as a performance car and reputedly contributed to the implementation of national speed limits in the United Kingdom. An AC Cobra Coupe was calculated to have done 185 mph on the M1 motorway in 1964, driven by Jack Sears and Peter Bolton during shakedown tests prior to that year’s Le Mans 24h race. However, government officials have cited the increasing accident death rate in the early 1960s as the principal motivation, with the exploits of the AC Cars team merely highlighting the risk. AC also produced the AC Frua until 1973. The AC Frua was built on a stretched Cobra 427 MK III coil spring chassis using a very angular handsome steel body designed and built by Pietro Frua. With the demise of the Frua, AC went on building lesser cars and eventually fell into bankruptcy in the late 1970s. 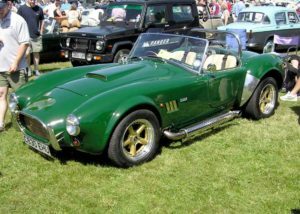 The company’s tooling and eventually the right to use the name, were licensed by Autocraft, a Cobra parts reseller and replica car manufacturer owned by Brian Angliss. In 2006 Carol Shelby’s own Shelby Cobra sold at an auction in Arizona for £2.8million. A road-going Shelby Daytona Cobra replica is being manufactured by Superformance and Factory Five Racing, a well known kit car company. These cars use Peter Brock’s bodywork designs, scaled up to increase room inside, and a newly designed spaceframe chassis, they are powered by Roush-built Ford Windsor (Sportsman) engines. The Superformance Shelby Daytona Coupe is the only modern day vehicle recognized by Shelby as a successor to the original Coupes. Peter Brock’s Australian namesake, the race car driver, was killed while driving a GM-powered replica of a Shelby Daytona Coupe in competition in Australia in 2006. To date most continuations are produced in fiberglass, with some very special customers custom ordering cars with aluminum or carbon fibre bodywork. Shelby Motors built 22 ‘427’ competition roadsters. In 1965, one was selected and converted into a special model called the 427 “Cobra to End All Cobras”. The first one of these (number CSX 3015) was originally part of a European promotional tour before its conversion. This conversion called for making the original racing model street legal with mufflers, a windshield and bumpers amongst other modifications. However, some things were not modified, including the racing rear end, brakes and headers. The most notable modification is the addition of Twin Paxton Superchargers. This gave the car an alleged 800 bhp and 462 ft lbs of torque at an astounding low of 3000 rpm. Officially rated at 0-to-60 at 4.5 seconds, legend and lore have it as doing that in a little over 3 seconds as one must lay off the throttle heavily just to get traction off the line. Dawn has been interested in vehicles since an early age and is the author of this article. She recently commenced researching the history of classic vehicles and wanted to share her findings with others by way of eBooks, which are located on her website. She is currently researching several manufacturers and the website is being updated on a regular basis. She also enjoys a game of golf and is working on lowering her handicap.